Highrise Building Services Pty Ltd setup a separate division, Highrise Gantries Pty Ltd supplying heavy duty gantries for numerous construction companies such as Grocon, Baulderstone, Bovis Lend Lease, LU Simon, Multiplex, John Hollands, Becton, Hutchinson, etc. Our Gantries are rated at 10.KPA loading and our unique design enables quick erection and dismantle on site. This assists builders in less time on site, reducing traffic problems and ensures more efficient construction completion. Large spaces between legs to open up driveways, walkways and laneways. They can also be adapted to provide double or triple storey for site sheds and storage. Gantries are made of all steel with checker plate decks and round pedestrian friendly legs. The Highrise gantry system is unique in that it does not require loose components that have to be put together on site. Realizing the necessity of the builder in having his footpath protection installed quickly, as in the greater percentage of cases this work is done at night or after hours, we have a gantry product that is basically prefabricated in our workshops and simply “unfolded” on site. 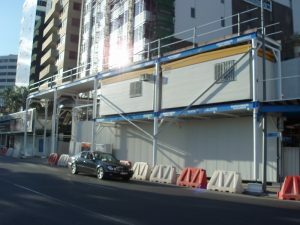 The Highrise Gantry System is used extensively in the building industry, Footpath protection, Siteshed Support, Craning Zone Protection and more. To find out more the follow the below link. Highrise Gantries has just recently completed in 2011 what is the highest temporary gantry platform system ever built in Australia. On the renown “soul apartments’ on the gold coast. 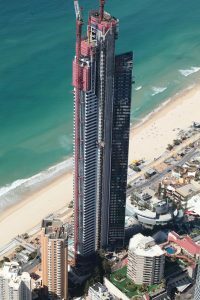 The builder grocon, required two man and material hoists to access 72 floors of the buildingon the external west face, however owing to the profile of the structure, the hoists could not access directly onto each floor. Highrise engineered, designed & erected a series of their standard platforms, seventy two floors high with decks at each level to access between the hoist and the building. Both the gantry and the hoists were supported from a large steel grillage erected at the base, spanning over the main access driveway leading into the public basement carpark.